Circuitron Electronics 5401 Currently out of stock, see AAR3 as alternative!! Bakatronics Advanced Auto Reversing Unt, AAR3 now available! Email Baka50@cox.net for details. Microprocessor control, more features, easy set up, station stops, current detection system and much more! 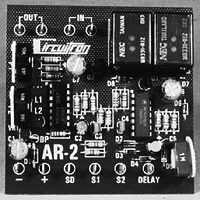 The CIRCUITRON AR-2 is a sophisticated, integrated circuit design, automatic polarity reverser for use on point to point layouts in any scale. 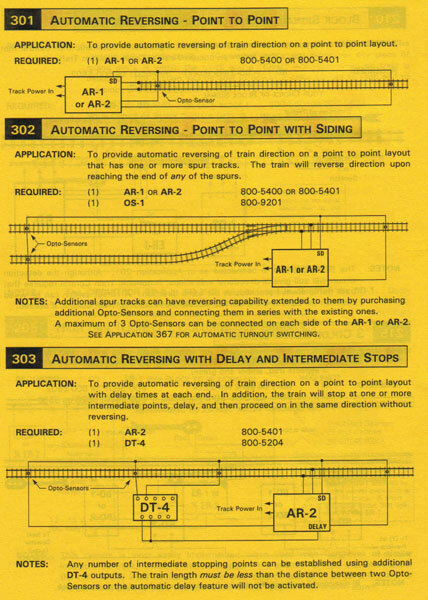 The AR-2 provides a 5 amp rever­sing capacity and also incorporates an adjus­table time delay circuit that will stop a train at each reversing point for a set period of time before reversing the direction. This time delay is adjustable from 0 to over 1 minute. In addition, a terminal is provided for external activation of the time delay circuitry without reversing direction. This terminal can be connected to a panel pushbutton or to the output of one of CIRCUITRON's detection circuits to permit stop and delays at any point. If a DT-4 Rolling Stock Detector is used in conjunction with the AR-2, up to 4 inter­mediate stopping points can be established between the reversing points. This is ideal for trolley or switching setups where you would like to have a train shuttling between end points, making various stops along the way. The AR-2 is constructed on a 3" square printed circuit board and requires a 12-18 volt AC or DC power supply for proper operation. 2 Optical sensors are included for each end of the line. DT-4 is sold separately and available from Bakatronics.